We all want to be as safe as possible it can b. this is the very reason that all of us take safety very seriously. While some of us buy the natural security gadgets of different kinds, others simply don’t believe in them at all. They even try to build their own protection systems. And when they try to make them they sometimes go a little bit too far in creating them that their initial purpose is lost somewhere along the way. 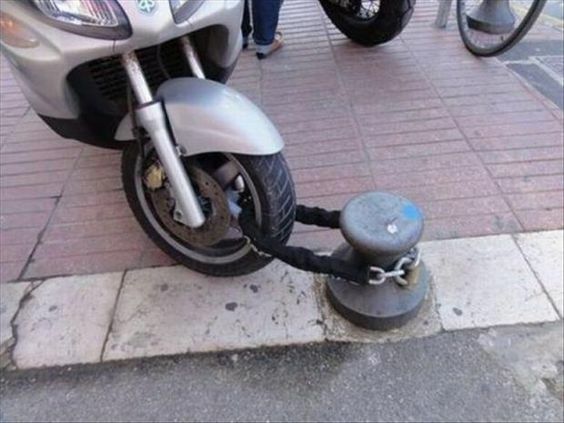 We are great supporters of personal security but we could not keep ourselves from sharing these hilarious security fails that had been carried out by some of the genius minds in the world. Once you see these pictures, you will say that there is no limit to some people’s imagination. So scroll down to look at these security fails that are too good to be true. There’s something wrong with this dog. Is this chain too heavy to lift? Don’t underestimate the power of duct tape. This locked gate is thought to have a high security level. This should be for a flying car. A future warrior is growing up.